male pattern boldness: Enough Muslins -- Let's Get Started! 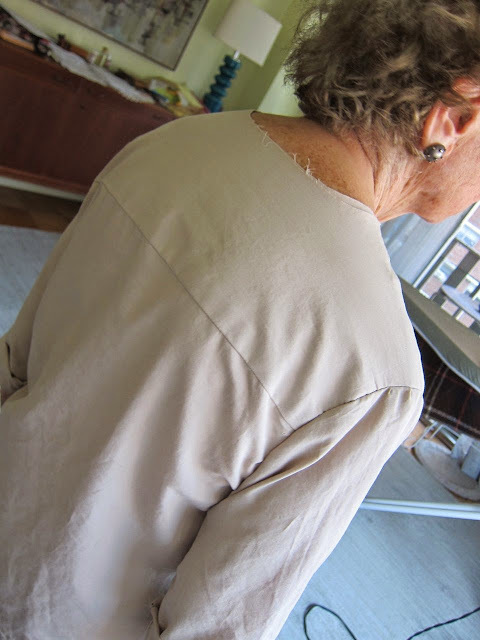 I added a full 1-1/2" to the back neckline. If there's too much, I'll trim. Better too much than too little. I still haven't decided what kind of collar I want to add; I may just go with a narrow band. My mother generally doesn't wear shirts with collars and her neck is short. Today, while trying on the muslin, she asked if I thought the print looked too young for her. I said, not at all. It's certainly not neutral, but I think it brings a lot of color to her face, don't you? It's cheerful. Tomorrow I'll tackle the sleeves and hopefully finish it by Sunday. Hope your sewing projects are going well. Color is ageless. Is that what I mean? Well, color is stable for any age as long as you are not making it into a midriff revealing top or low slung pants or a mini-skirt. It will make her LOOK young and that is the point. Oh, and I left out skin-tight as an age/weight no-no. I think she looks great in that print. that print is wonderful on your Mom and the current iteration is very flattering. what a great make. looking forward to seeing more, and Michael's beautiful shirt, as well. I believe that as one ages it's very important to wear colors that flatter your skin. I'm 67 and wear tones on which I receive compliments. If I wear neutral clothes I wear colorful scarves and jewelry. I think your Mom looks great in the fabric your purchased and good job on the fit. Those colors are really beautiful on her. It's a great match. 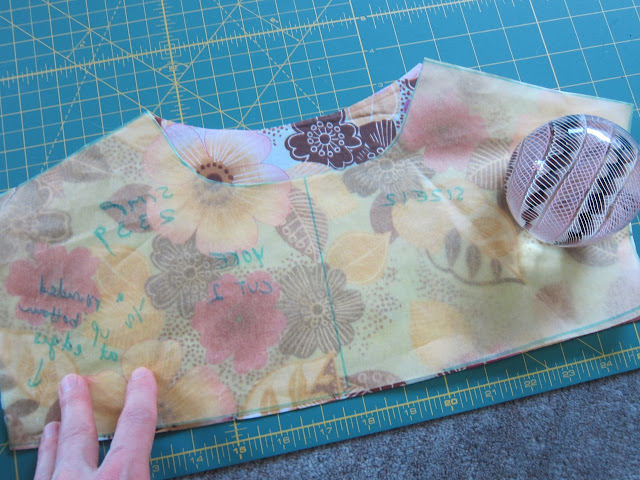 Sewingkm, I like your strategy. Mom's close in age to you and I usually am her 'shopping" or dressing consultant because I want to ensure she wears flattering things that look coordinated, not too random. Besides, prints in clothing help Mom to look interesting to younger people, making small talk easier to keep going. It's summer, the narrow band collar would be cool and comfortable. I love that fabric on your mom, she looks great in it. It's a pretty print on your mom. Nice job on matching the print too. Agree that the print looks great on your mum that it brings colour to her face. Oh, Peter, you're making me wish my dear late Mother were still around for you to sew for her! Of course, you'd either have to really work to find some just-right novelty fabric or spend lots of time on fine handwork, as for many years most of her day clothes were covered in embroidered whales, frogs, hippos, etc. ; on the other hand, I suppose it doesn't take that long to make wrap skirts.. I think she looks adorable in it. I think a colorful top and neutral pants are great on older peeps. Check out the Alfred Dunham collection at Macy's. He designs for a golden girl set. Think channeling Rose Nyland. Although your blouse is much more savvy jazzy. Love the color on Mom. Mom, or not, I'd probably take in the waist a half inch front on either side, leaving the hips and bust the same. Don't tell her. It might be more flattering without looking forward in a way she might not want. It's looking great and becoming colors for her. She certainly looks happy about it! Why not try a camp collar (don't know what it's called in te U.S., it's the type on a Hawaiian shirt). Folds flatter than one with a separate stand and feels softer too. They're very suited to women's blouses. I'm 67 and I like a collarless shirt. The color and pattern look fabulous on your mother. When I turned 65 I decided I was old enough to wear anything I please, and so should she. She looks great! Please have her model on the sidewalks of NYC. Just like you pointed out - it adds color to her face which is true! The print is just big enough and the colors really make her pop! And you Peter, are a sweetheart! Peter, could I suggest you take pictures of your Mum at her eye level rather than yours. I think the angle here makes her look disproportionate. Good point -- I will try! Please tell your mom she looks great in this fabric. It's rarely fabric itself that's "too young", but rather how it's worn - the styling, accessories and the wearer's attitude. This is spot-on for her. I have a negative built-in "too young" reaction, especially with regard to color. On the other hand, your mom sounds uneasy about the color, so you should ask her if she likes the color/fabric. This may be a way of saying, "It's nice dear, but better on you or Michael." I'm talking about myself here, of course ... Projection: not just for therapy! The neck adjustment is wonderful. Going around with a gaping neckline would be such a drag, particularly in winter. Lovely shirt, lovely work. 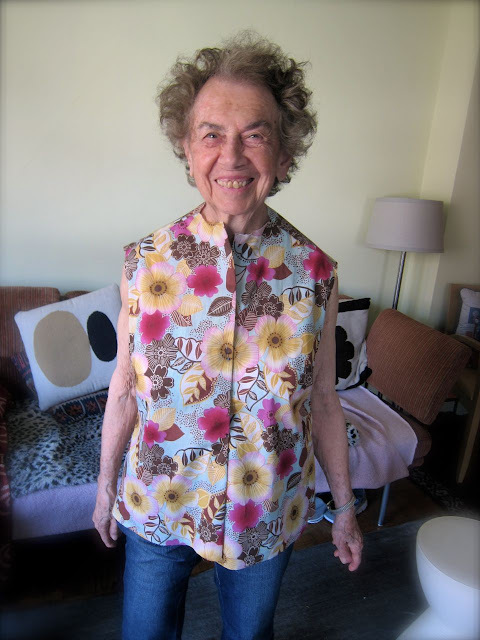 Never too old to rock a great print! It looks wonderful on her. 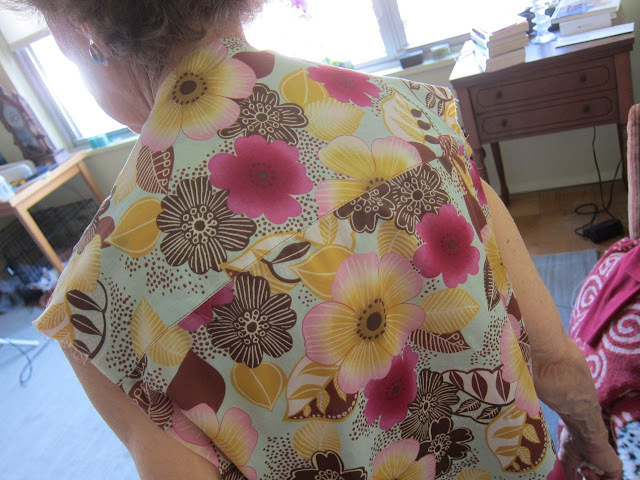 I'm 51 and I worry about clothes being "too young"- she looks gorgeous in this fabric! With all due respect, I cringed when I read comments on the muslins that said that blecch fabric was her color. It really washed her out, but this fabric brings her alive :) . Can't wait to see the finished product- oh, I vote for band collar. Simple and cool for summer. I love the print, too! Your mom looks great in it! The print is modern, but the colors are fantastic on your mother. The shirt is perfectly up to date, but not too young. I agree with other comments about a nice simple band collar and some very plain buttons. She can wear it with any pant or skirt she already owns. It's a beautiful print that will blend with many items she is already comfortable wearing. A few complements from her friends and job done. I think the colors look beautiful on her. I think it's a fun print, not too young for her at all!